I have been blown away by the vocals of Ellie Holcomb and her new album which is titled 'As Sure As The Sun'. This album is Ellie's debut full-length solo effort, but this album is not her first release. Ellie recorded and released two EPs full of songs based on the Psalms and other scriptures, 'Magnolia EP' and 'With You Now'. After releasing both EPs Ellie says that she "cried joy tears for about a week just dreaming about how God would encourage people through His word in the songs." 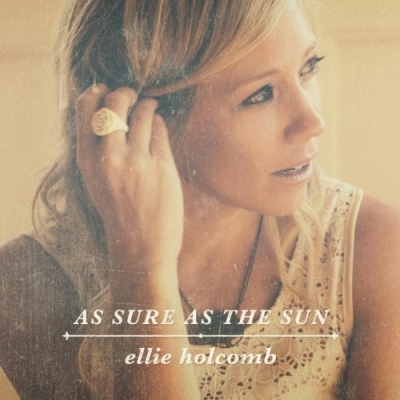 Read More I have been blown away by the vocals of Ellie Holcomb and her new album which is titled 'As Sure As The Sun'. This album is Ellie's debut full-length solo effort, but this album is not her first release. Ellie recorded and released two EPs full of songs based on the Psalms and other scriptures, 'Magnolia EP' and 'With You Now'. There are two parts to this review, part one 'The Songs' and part two 'The Voice'. Let's start with part one, the amazing songs. Each song on this album tells a story so melodically and poetically that the words seem to glide together with the music. All eleven songs sound so fresh, so clean and pristine. 'Marvelous Light', 'Love Never Fails' and 'The Broken Beautiful' are happy, clear, summer-breeze fresh sounding songs that will just leave a smile on your face. Then there are songs like 'As Sure As The Sun' and 'My Portion and My Strength' that are so hauntingly beautiful they leave goosebumps on your arms. Again these alluring songs hit all the right spots. Now onto part two of the review, Ellie's vocals. Where do you start? They are simply fantastic, with a softness to them that can't be compared. When Ellie sings these wonderful songs they just come to life. A different artist wouldn't sing these songs in the same way Ellie does. Her vocals are the sparking gems in these songs. I have truly fallen in love with this album, I don't think it's one thing in particular, I just think as a whole package this album works perfectly. There is a clean, fresh sound to these songs which make you feel this isn't just an artist copying another artist, this is Ellie singing her stories and her feelings on one amazing album.